Last updated 24 October 2018 . By Georgia Evans. It's been named the world's healthiest restaurant, and now Redemption Bar is opening its third location in Covent Garden, complete with London's first non-alcoholic cocktail bar. 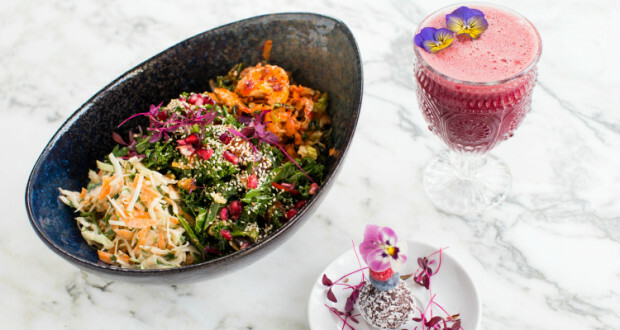 After a successful crowdfunding campaign that raised an astonishing £300,000, the new venture for co-founders Catherine Salway and Andrea Waters will feature a menu that sticks to the same health-conscious ethos of its sister sites in Notting Hill and Shoreditch. Offering fresh, vegan, gluten-free dishes that are naturally low in sugar across lunch and dinner, guests will be able to indulge on Buddha Bowls they have built themselves, as well as functional foods utilising charcoal powder, pine pollen and medicinal mushrooms. The restaurant itself will be a cosy 45 covers, with a brand-new takeaway section. Drink-wise, the alcohol-free bar will serve up cocktails such as the pious pina colada, lychee and yuzu martini, frozen pineapple margarita and the Redemption Royale. There will also be kombucha, a drink derived from fermented, effervescent black or green tea, as well as alcohol-free beers, wine and spirits. Combining traditional British design with contemporary colour schemes, the interiors of Redemption Bar will be just as vibrant as their food and drink offerings, boasting bright colours of teal and splashes of coral pink, to complement the marble and brass fixtures. The space is flooded with natural light through the sky lantern above the bar and bi-folding doors, giving guests the chance to sit in London's iconic, quirky setting of Neal's Yard in the summer months.